There is much research to show that the adoption of cloud-based services is now widespread. It is also widely reported that the foremost concern about such services is the security of data. 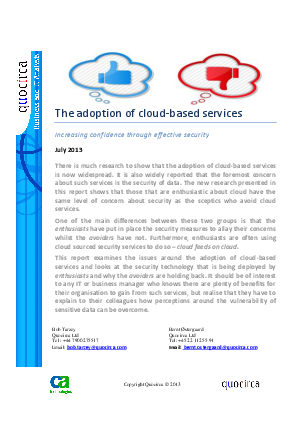 The new research presented in this report shows that those that are enthusiastic about cloud have the same level of concern about security as the skeptics who avoid cloud services. This report examines the issues around the adoption of cloud-based services and looks at the security technology that is being deployed by enthusiasts and why the avoiders are holding back. It should be of interest to any IT or business manager who knows there are plenty of benefits for their organisation to gain from such services, but realize that they have to explain to their colleagues how perceptions around the vulnerability of sensitive data can be overcome.